I’m reminded every day that summer is fast approaching. And while I haven’t even figured out what to do for spring break, I realize that many parents are already making plans for when school gets out. For those more organized than I am, here are eight great ideas for family travel from now through the summer. From adventures in one of my favorite sates — New Hampshire — to the white sand beaches of Florida to the local San Bernardino Mountains, adventures can be had by every family. Set along the spectacular presidential mountain range, nature calls your name at the Omni Mount Washington Resort in Bretton Woods, New Hampshire. The 200-room resort provides kids of all ages with an array of activities to keep them happy, including fishing, swimming, rock climbing, mountain biking and horseback riding. In addition, kids can always be found having a blast in the game-room, indoor and outdoor swimming pools and playground. Those who are more adventurous will also love the Bretton Woods Canopy Tour – one of New England’s longest zip lines. When parents need time to escape, they feel comfortable leaving the kids with the resort’s expert team of counselors at The Kids’ Club where fun and engaging events, like stuffed animal Moose Hunts, are planned daily. Families can also sip tea like royalty in the Princess Room. The resort even offers a children’s “Mad Hatter” tea, with kid-friendly snacks. When families aren’t outdoors they can take a break in one of the hotel’s six eateries and at the end of the night wind-down with a milk and cookies turn-down service. Rates start at $279 per night. 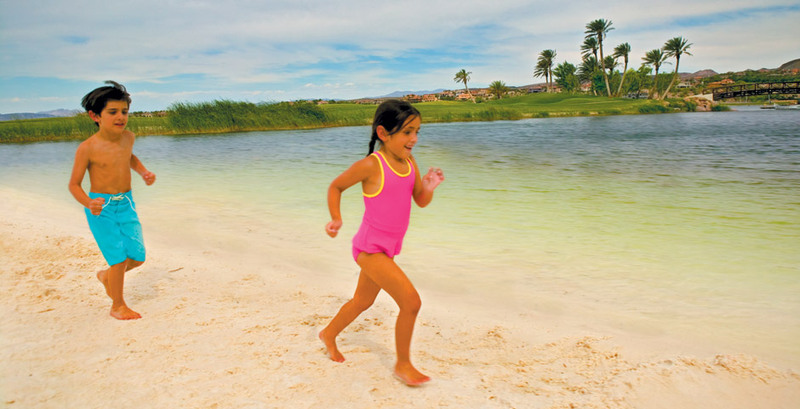 Plan your next family getaway to The Westin Lake Las Vegas Resort & Spa for a kid-friendly vacation full of lakeside exploration and quality time with your loved ones. Located 20 minutes from The Strip, the resort is situated on Lake Las Vegas and is the perfect place to launch a desert adventure. On the lake, families can kayak, take gondola rides, and boat, and off the lake, the resort boasts a pool with a water slide. Kids can enroll in the resort’s Candy Sushi School, where they learn how to make rolls from their favorite sweet treats. For those seeking an adrenaline rush, the resort can arrange soft-adventure sports, including kayaking, whitewater rafting, hiking and biking around Henderson, Nevada. The resort is also in close proximity to area attractions such as Red Rock Canyon, The Neon Museum, and the Pinball Hall of Fame. Book the Love Your Family Package and kids 12 and under eat free with connecting rooms when you book two or more rooms. Room rates from $143 per night. Families who want a luxury hotel without the crowds and the exorbitant prices can hit Fort Lauderdale in Florida where luxury waterfront hotel il Lugano will run a Summer Savings promotion from May 1-September 30 when hotel rates are at their lowest. Soak up the sun with rates starting at $129 per night for a water-view suite. This all-suite boutique property has everything a family could need – in-room kitchenette, washer/dryer and water views from every room. The hotel has a pool, but there are also free transfers to the sea (with beach gear included) if the kids prefer the waves. www.illugano.com. Nestled in a former mining town in a box canyon, Telluride is surrounded on all three sides by the 14,000-foot peaks of the San Juan Mountains, which provide the ideal environment for a summer getaway packed with hiking, biking, and outdoor activity at all skill levels, from the 2.5-mile hike up Ajax Peak and the 13-mile Wilson Mesa Trail to the San Miguel River rapids. Soak up all that Colorado has to offer in the summer, with hikes up into the mountains, picnics, outdoor yoga, fly fishing, and rock-climbing. Known as the festival capital of America, this summer is filled with weekend festivals. This year’s lineup includes the Telluride Bluegrass Festival (June 19-22), Telluride Yoga Festival (July 10-13), and Telluride Film Festival (August 29-September 1) – all perfect for aspiring bluegrass fans, yogis, and film critics. Hotel Madeline makes it easy for families to come out West and stay a while with two and three-bedroom condos that include: full kitchens, living spaces, washing machines, balconies. Room rates begin at $237 per night, two-bedroom condos begin at $551 per night. Escape the buzz and business of Los Angeles for a family weekend and pass a few lazy summer afternoons at the quintessential American camp-era resort. Just a short, scenic drive from Los Angeles, Lake Arrowhead Resort & Spa is the perfect weekend getaway for nature lovers, mountain climbers, and those wanting to spend time with their loved ones with classic campsite activities in a luxury setting. Tall pine trees surround pristine Lake Arrowhead, which offers swimming, boating, and water-skiing to the weekend warrior. Guided nature hikes around the San Bernardino National Forest and guided walking tours of Lake Arrowhead are available, so everyone in the family can explore stunning trails. In the evening, the resort offers Fireside Chats, where guests can watch the sunset, roast marshmallows, and listen to an expert from the San Bernardino National Forest Association tell stories and tall tales about the area. Rates from $206 per night. Whether you’re spending time with your own children or your children’s children, you’ll find Kiawah is an idyllic getaway for the whole family. Kiawah Island is a picture perfect destination located 21 miles south of Charleston, South Carolina. The island is complete with world-class golf courses, year-round pleasant weather, miles of beaches, wildlife and 123 acres of parks, playgrounds and sports fields. Kids can choose from “Kamp Kiawah,” where counselor-led programs are available with sports, scavenger hunts, art projects, camp fire activities, as well as the Night Heron Park Nature Center exhibition which features nature tours and naturalist-led programs, exhibits of local wildlife, interactive displays, and more. The entire family can enjoy a round of golf with the Family Tee Program, which invites players of all ages to learn the game on four of the resort’s championship golf courses, with specially placed family tee markers set in each fairway for all members to tee from. Children under 17 even play for free! Over the years Kiawah Island has become a haven for yearly family reunions and vacations. Families can rent one of the many homes on the island and live comfortably like the locals during their stay. Located in the heart of Boston, Fifteen Beacon is a luxury boutique hotel offering a classic family getaway for travelers looking to visit Boston this summer. With complimentary drop off and pick up to the city center via Lexus car service, the knowledgeable drivers also double as tour guides and can help you plan the best itinerary possible. Walk through the celebrated Freedom Trail, go on a famous Duck Tour, and watch a baseball game at the park where Babe Ruth once pitched. Get inspired by renowned works at Boston’s Museum of Fine Arts or check out the new penguin exhibit at the New England Aquarium. After your day come back to Fifteen Beacon and indulge in a family style dinner at Mooo… Steakhouse located in the lobby of the hotel and let the highly acclaimed staff take care of the rest. Rates starting from $345 USD. The eco-friendly and modern Hotel Vermont is the first independent hotel to join the quaint town of Burlington with activities for kids and adults. Perfect for an extended family getaway, the hotel invites guests of all ages, to enjoy perks such as a Bedtime Menu including Lunaroma Aromatherapy for the grandparents, and Vermont Flannel pajamas and Teddy Bears for the kids. Other activities the family can enjoy are complimentary bike rentals, a variety of massage therapies in studio and in-room, regular yoga classes and sailing. After a long day of shopping in Vermont’s shopping district, which is right outside the hotel’s doorway, check out the “carbon-negative” cocktails and outdoor terrace with an open hearth overlooking the scenery of Lake Champlain and the Adirondack Mountains. Rates will start at $195 per night.